When you run your own business it can sometimes be hard to be objective when it comes to marketing, and even the most solid of strategies can benefit from a little outside perspective. 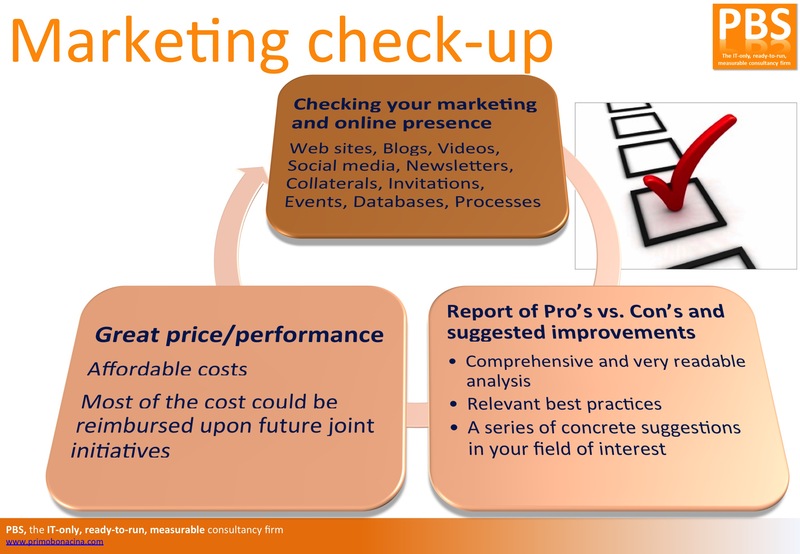 Spending money on initiatives that aren’t effective is false economy but, by giving your marketing an independent ‘check up’, we can identify what is and what isn’t working, putting you on the path to business growth. Many companies are aware that their marketing effort and online presence are not modern and adequate any longer, but they do not have the time, skills and focus to make it happen in a different way. Is it useful for visitors? Is it able to convert visitors into prospects and customers? Or is it instead an enemy of your sales strategy? This service will have a very affordable cost. And most of it could be reimbursed upon future joint initiatives.